The NOVA Ceilings DUST DEFLECTOR is a one-piece plastic deflector that prevents the buildup of dust and dirt on the ceiling tiles surrounding the air vents. Leading hotel brands, office management groups, restaurant franchise groups and retail real estate developers have all learned of the dynamic reduction in labor expense possible with the DUST DEFLECTOR from NOVA Ceilings. They all count on the DUST DEFLECTOR on their properties to keep their ceiling tile appearance professional and clean. Each DUST DEFLECTOR can be installed in minutes on standard size air vents and immediately starts saving time and money. The DUST DEFLECTOR from NOVA Ceilings saves maintenance costs, reduces maintenance time, and keeps the ceiling appearing neat and clean. The NOVA Ceilings DUST DEFLECTOR can be installed in minutes on standard-sized air vents. Without this product, ceiling vents can gather dust, dirt, and other contaminants over time. 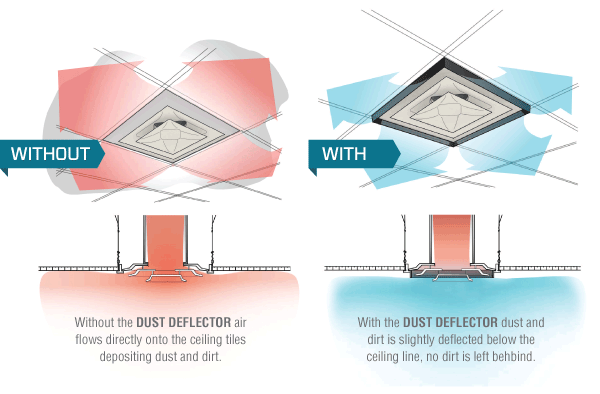 The DUST DEFLECTOR from NOVA Ceilings saves maintenance costs, reduces maintenance time, and maintains the clean appearance of your ceiling vents. The Dust Deflector is a one-piece plastic deflector that prevents the buildup of dust and dirt on the ceiling tiles surrounding the air vents. It suspends one inch below the ceiling line, slightly deflecting the dirty air away from the ceiling tiles. This keeps your ceiling tiles cleaner for years to come.